Work by award-winning Bay Area artists Jaime Guerrero and Viviana Paredes. MACLA closes its 2014-15 season with Breaking Point. Glass, a medium valued for its visual and tactile qualities, is used inventively by these contemporary artists to provide clarity on contemporary social issues. 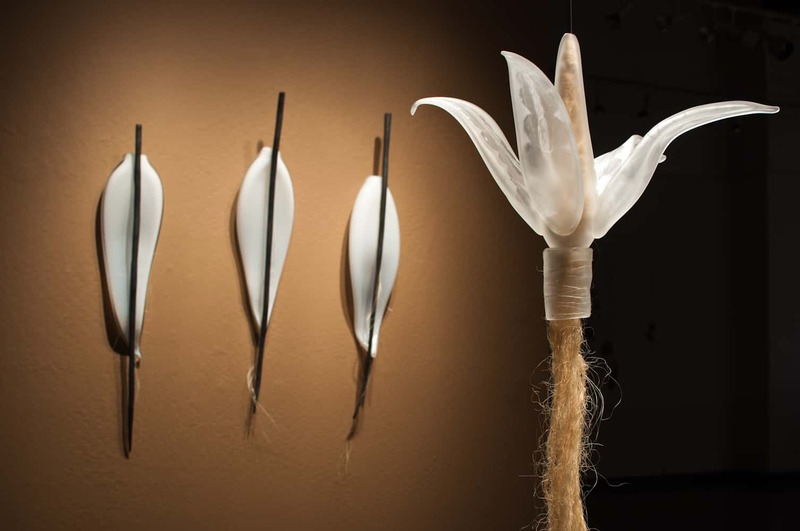 Guerrero and Paredes use glass as a vehicle to explore and critique issues as diverse as the effects of over-hunting to the extinction of dialects and cultural customs. Though MACLA has previously exhibited these artists as well as other artists who work with glass, this is its first exhibition dedicated solely to the medium. Focused in scope, it illustrates the emergence of glass as a key medium in terms of visual activism, and its journey from purely decorative. Breaking Point coincides with the Glass Art Society (GAS) Conference taking place June 5-7 in San Jose. Artist Talks: Friday, June 5, at 7:00 pm, on South First Fridays. Related program: Site-specific glass installation, a collaboration between youth of Public Glass and DMC Studio, from June 5-7.